The 7400 comes with a 550-sheet cassette tray that supports papers from recycled 17# to 80# cardstock, sizes ranging from 8.5“ x 11” up to 12” x 18”. The side panel hides a 50-sheet multi-purpose flip tray for labels, 4” x 6” post cards, envelopes, paper bond weights up to 100 pounds, transparencies. For more capacity, up to 4 more 550-sheet trays can be attached for 3,000-page capacity. After the 12 second delay for the first page, the Phaser 7400 prints at speeds up to 40 ppm in black-and-white. Using single-pass color printing, the printer will shoot out pages at its highest resolution at an impressive 36 pages per minute. In 600 x 1,200 dpi Enhanced mode, smaller fonts and fine lines are sharp. Photo mode produces brilliant photographs. The base-model 7400 comes standard with Ethernet, parallel, and hi-speed USB. 256MB of expandable memory enables the Phaser to handle any size print request from any number of computers or set up on a server. 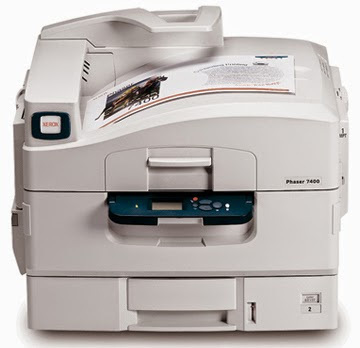 For color matching in publication, the Phaser 7400 can be set for Apple ColorSync, CIE, PANTONE, and Adobe PostScript color standards. The intuitive control panel on the Phaser 7400 has a 6-line animated LCD Display that defaults to show toner levels and information. The buttons are set up to make understanding what each one does pretty intuitive. The control panel, toner levels, printer information, configuration, errors, and network settings can be performed directly through the control panel.